I owe thanks to Facebook founder Mark Zuckerberg for helping turn on my lights. Yep, it’s true. Something happened to me a few years back while watching a Facebook news conference that set in motion a journey for me that has brought me to a place where my personal and professional life has become intertwined. In the press conference, Zuckerberg was talking about how Facebook was not in the business to build applications. They were in the business to build infrastructure in which application can then be built upon. It is amazing that something so simple can be yet so profound. But first, let’s reverse engineer back to the meaning of these words. With these definitions in mind, let me break down how they have impacted me from both a personal and professional stand point. If you have been following me over time, you will know that I have been working on a book for way too long. Well, as I write this, the book is finally only days away. To keep updated on the release, click here. So often, we are in a rush to be relevant. We are in a rush to say guess where I am in this fast growing social media world. As we do this, we don’t often realize that we are making a huge mistake. What we are doing in the rush to be relevant is to mistake application for infrastructure. When we do this, we eventually run out of ideas and therefore end up shooting from the hip our very message. I recall watching one of the debates during the last election when one of the candidates failed miserably to answer a question. It was so bad they needn’t ever tried to in the first place. It was plain miserable. As I watched, I thought to myself… you got to own it, to sell it. You can’t mail it in by simply cutting and pasting from the mind that which you heard from someone else. That’s simply applying knowledge on top of a lack of understanding of it to only appear to be one of knowledge rather than one that is of knowledge. In the end, I believe this is the difference between intrigue and noise. Application without infrastructure is like a message without a rudder that only sets sail to create more noise and less effect. In my forties now and reflecting back at life, I recognize that we sure can collect a lot of baggage in life. With all of this baggage, have we ever stopped and truly took a long hard look at it and asked this one question… why? So much of this baggage we must understand is baggage we were never meant to carry. So, why carry it any longer? I too have come to a place recently where it was time for me to ask this question of myself. Certainly from time to time in the past I had asked it, but I was not ready to own it. And So, like insanity, I banged my head against the wall everyday and expected different results as I tried to fix it myself or sought to apply the guidance others had given me. What was it, you ask? I suffered from low self esteem and approval addiction. Yep, it’s true. This was the effect of the baggage that which I carried throughout my life. The cause, you ask? That’s for another post. With carrying baggage throughout life, too often it seems it collects on us unknowingly like barnacle on the side of a dock. In doing this, it has an effect on us in that at some point, we begin to believe that it is actually part of us and therefore it can cause us to become someone we were never meant to be. By the time I truly recognized this, I finally stopped long enough to see the wake I had left behind in life because of it. A lot of times, we are already aware of it but are too numb to do anything about it so we run the other way. Or as I stated a moment ago, we essentially seek to force the application upon what infrastructure we think we have by attempting to fix it long enough to survive another day while keep those around us at bay. Oh, you mean to tell me this square peg will not fit in this round hole? Here is where my lightbulb turns on. Application is not sustainable when built upon faulty infrastructure. What I realized is that for every time I made a bad decision and then cycled through it over and over and over, is that though for a moment the guidance I was given (or willed it myself) to help effect change worked, it was not sustainable. Oh the pains of recidivism and we don’t even know it. What I found is that though as well intentioned as they were or even I was, the guidance I was given was really a form of application. Yet, it was never sustainable because the infrastructure it was built upon was faulty and needing to be rewired. Application was never the core problem. The infrastructure was. And let’s be honest, when one is not ready to own something, they will say and do whatever they can to survive another day only to fall back into that vicious cycle once again. As I said earlier, you got to own it to sell it and perhaps with this, you have got to own the infrastructure to sell the application. Until I was willing to own baggage and recognize that I was never meant to carry it as well as own what I have allowed it to become in me, nothing I could do would really make one bit of difference. Sure I could seek to will it into practice with hopes of creating new habits, but it will not last. So, I let go and recognize my infrastructure (my heart) is faulty and needs to be rewired, replaced, or reconnected to this life I am seeking to live within. It’s amazing when one can recognize the root of the problem and the effect it has on the guidance one gives it. Throwing application at a problem where faulty infrastructure dwells is like throwing darts with a blindfold on and hoping for the best only to find out later that you were aiming at mid air. For me, I am ready to set sail with new infrastructure and upon this infrastructure, I am ready to put into action applications that will help me get the most out of life rather than life getting the most out of me. 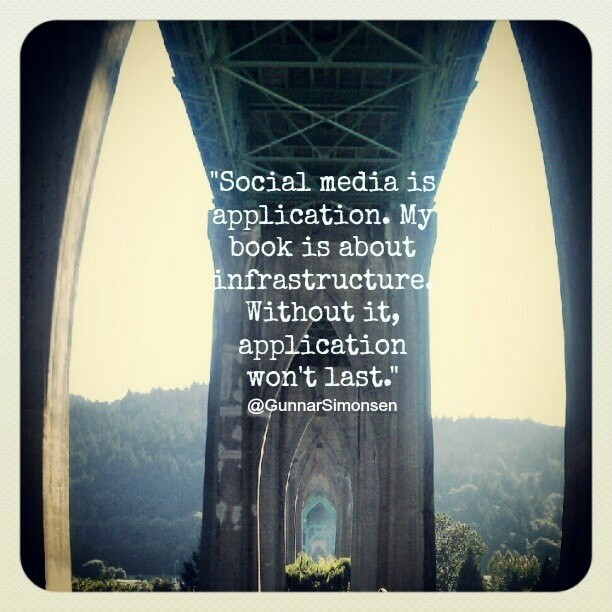 And this is how infrastructure and application changed my life. Thanks Mark, I had no idea. I guess God really does work in mysterious ways. If only we would let Him in the first place. Previous Previous post: What does ready look like? When there are no guarantees for tomorrow. wow!! Thank you so much for stopping by when this came up in search. This whole concept has been huge for me. Definitely a game changer!! God Speed to you as well!!! Hello Gunnar, I loved this read. I googled this because I am in IT and I am trying to learn the difference between infrastructure and application however when I read your article I was hit with some truth. I am not happy in my new job and I think it is because of resentment I am holding inside. Only thing is how to get rid of it? To me easier said then done. Hi Sam, it’s funny how sometimes a search for one thing can lead us to finding the “right” thing. Much like me watching that press conference with Mark. I expected one thing and instead the lightbulbs starting going off. I totally understand the resentment piece and how that can take over one’s life especially in a job or even in a relationship. I have had to wrestle with stuff like this the past couple years, too. It certainly takes time, but when one can begin to identify the why of the resentment, there are things one can then do to work their way through the resentment in a healthy way. I have actually tried to cover my own journey through such on this Thoughts Horizon blog. But, if you want to share more, I would be happy to share with you what I have learned. You can email me at gunsim@msn.com if you would like. Thanks for posting a comment and I am grateful you found this article helpful. Wow. I had to read this twice. Thanks for this was life changing. I applied this to every area in my life and must say I definitely feel lighter getting rid of baggage and identifying the need to rewire my infrastructure so my application tools of life will stand sure..I not only own this but owe this to myself. May God continue to use you.